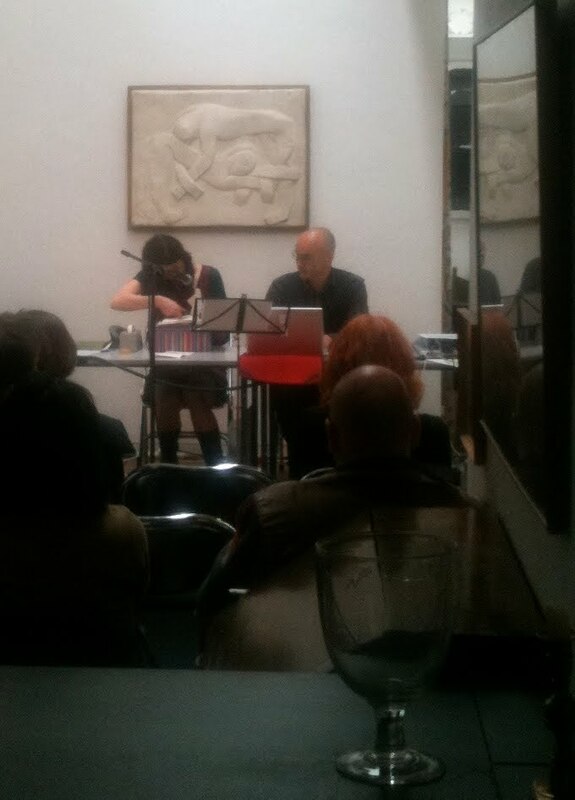 Kettle’s Yard had today a CoDEful of people performing on “Musical and Poetic Approaches to Technology, from subversive, DIY and historical perspectives.” By CoDEful I mean Katy Price, Tom Hall and Richard Hoadley, all affiliated with our institute. The experimental takes on sound, music and performance moved from digital investigations into soundscapes (Katherine Norman’s pieces) to for example physical computing and interface experiments as with Richard Hoadley who performed with his self designed Gaggle too — along with two new devices, Wired and Gagglina. I truly enjoyed Katy Price’s performance piece Bookmachine which is described as “found poem drawn from three sources about books and machines.” The opening line “the book is a machine to think with” is a declaration of book’s haptic, sonic, material qualities; an exploration into the pragmatics of the book. (And as I learned, comes from I.A.Richard’s). Indeed, the book is touched, scraped, made into a sonic platform; it is torn, taped back together, punctured. The book is less read, and when its read, its not a work of extracting meanings from it, for sure. The book is “typed into a BBC Microcomputer simulator running ‘Speech’ and the speech facility in a Macbook.” The book does, and is an object of doing much more than meaning in a Deleuzian spirit. This is where I am alluding to, Deleuze and Guattari on the book: the root-book is very different even if its the classical form of the book; hierarchical and full of meaning. We read such books as we should read books — the way we are taught. Start in the beginning, think of what it means. The modernists then were already cutting up books (cut-ups by Burroughs) and making new kinds of series proliferate. But books can be made to do other kinds of things; books are machines, and machines connect. They connect to senses, new uses, making books into objects, trajectories, surfaces, scapes. A machine to think with alludes to the fact that books always function as part of assemblages. We like to think of book’s as organic and self-sustaining, but they always are there to help to do stuff, to think with, to accompany. We become with books. And if the book is a machine to think with, it also alludes that there are other machines to think with too; that the book is a machine similarly as computers and such are. “…literature functions as a war machine. ‘The only way to defend language is to attack it'(Proust, quoted in CC4). This could be the principle of much of modern literature and capture the sense of process that aims beyond the limit of language. As noted above, however, this limit beyond which the outside of language appears is not outside language, but appears in its points of rupture, in the gaps, or tears, in the interstices between words, or between one word and the next.” (Lambert, The Non-Philosophy of Deleuze, 141). Literally, what lies between words are blank gaps on the page, but also paper, and the porous surface of inscription. There is always a lot that goes on between any word – much more than hallucination of meaning. The stuttering “and” is what constitutes an experimental assemblage of the book machine which tries out the various material modalities in which text, covers, paper, expose much more than meaning. The rhizome-book is the bookmachine, it reaches to outsides and neglects illusions of books as images of the world. It represents less, but sounds a lot more. The book too has its on level of “body without organs” — the final phrase from the performance. Much more, such perspectives relate to futures of literature and literature studies. New territories of how we approach literature, books, meanings do not take at face value the idea of hermeneutics and deciphering meanings in that traditional sense, but are open to, well, opening up the book in different ways. Literature can be made into such new contexts of use and imagination where semantics and interpretation can be seen as only one way of “practicing literature”. This is where the translation of literature whether into data open to algorithmic manipulations, or then new realms of sensation in terms of multimodality, or part of other creative, experimental takes finds its futures. >Great write-up of a fun concert Jussi. I took some photos during the performance and I've posted them up on flickr: http://www.flickr.com/photos/dumbledad/sets/72157623907216119/ Enjoy! >Thanks! Good pictures compared to my low res Iphone one…and thanks…it was good fun the concert, all of it!